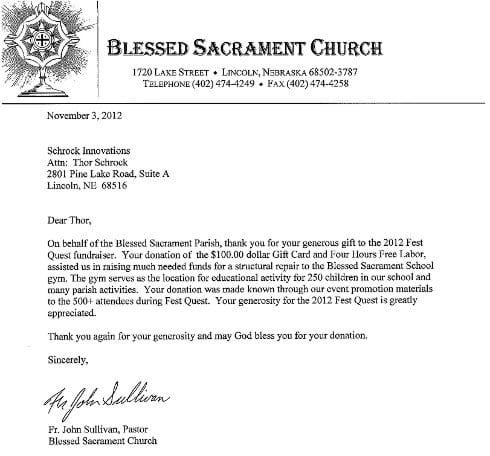 Schrock Innovations made a gift card and free labor donation for the 2012 Fest Quest fundraiser in Lincoln and helped the Blessed Sacrament School raise precious funds necessary to repair structural damage to their gymnasium. This gym plays an integral role in the education of 250 students in the school and is used for a variety of different parish activities. Donation Helps Good Shepherd Presbyterian Church Raise $9,400 Cathedral of the Risen Christ Church Schrock Donates to Christ Elementary School Fundraiser Schrock helps to raise almost $13,000!